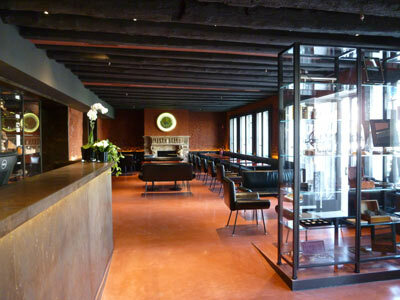 Hotel L'Orologio, opened at the end of 2014, is situated on the Grand Canal in Venice. 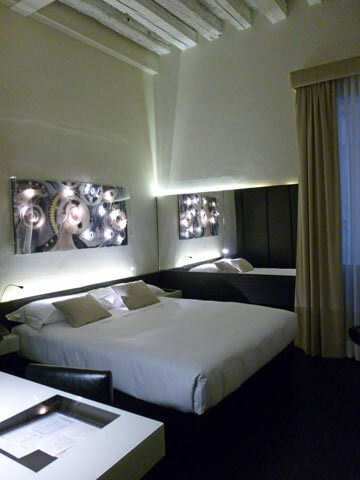 Unusually for Venice, it is a hotel with a very modern ambience. I stayed there a few months after it opened. This is a smart and fairly pricey four-star hotel. Many visitors will feel it is worth splashing out on one of the premium canal-view bedrooms, but since the hotel has forty rooms (a lot, by Venetian standards) and different room-types, guests may be able to choose from a range of prices, and even (especially off-season) find a decent deal. I stayed for six nights in March, and thought it was a good-value place to stay. Most Venetian hotels are small establishments in historic buildings, often more like B&Bs than international hotels. This one is very different. Aimed at the more demanding kind of modern travellers - lovers of weekend breaks, honeymooners - it has high standards and a cosmopolitan vibe. Part of a small Italian chain, the Hotel L'Orologio (which means watch or clock) is themed around timepieces and has a self-conscious designer style. Although the exterior is nondescript, the building's interior has been modernised with lifts and mod cons. Guests are welcomed at a front reception desk facing the Grand Canal. Polite and multi-lingual staff were on duty at all times, and my arrival was pleasant and well-managed; within minutes the formalities were completed and I had been shown up to my first-floor bedroom. I was first struck by the modern style, but most importantly the room was a decent size (not generous but comfortable enough) and at a glance very well-equipped. Being a rather jaded frequent traveller, I wasn't particularly impressed by the watch theme (reflected in artworks, door handles, tables and so on), and found it a bit over the top. 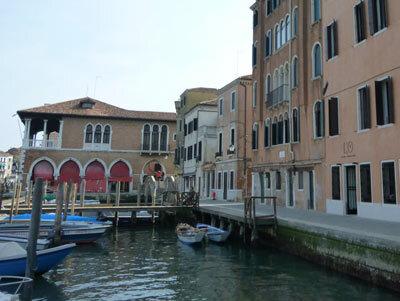 While the theme has relevance to the hotel chain, it has none to guests nor to the city of Venice. It does, of course, fulfil the aim of giving the hotel a distinctive identity. Again with a cynical hat on, I felt the interior was over-designed. The 'designer style' was modern with a nod to the 1980s: all glossy red and black. Bedrooms have a couple of different colour schemes; mine was very heavy on the black. While hiding any wear and tear, this made parts of my bedroom so gloomy that I banged my head once, and found myself peering to locate dark-coloured items against the floor and black cupboards. The shadows could have been fixed with bright lighting, but the room's lighting was fancy too. Again a matter of taste, but I'd prefer a simple lighting system which is easy to operate. Here there were only a couple of lighting options, but these included lights concealed in all kinds of odd places - down the edge of the curtain, under a cupboard. Areas of the room, including the entrance lobby, remained resolutely dark however many light switches I operated. My room was good from practical perspectives. A decent size for a cheaper category room, it had a double bed, a couple of chairs, a desk, wardrobe and shelves, a large mirror along one wall, and the window had curtains as well as shutters. The floor was black wood and marble. Unusually there were electrical sockets for computers, a USB charging socket and sockets by both sides of the bed. The safe was big enough for my laptop and I was very pleased to find a tea tray with a kettle, choice of teas and instant coffees and milk sachets. The room had a mini-bar fridge, although as it was intermittently noisy overnight, I could have done without this facility. A lot of thought had gone into equipping the bedrooms. I can't understand why so few Venetian hotels provide coat-hooks, though; especially in wet weather it's annoying to have nowhere but the back of a chair to place your outdoor clothing. I visited in early spring, when Venice was still chilly, and I found the room quite cold for my first few nights, no matter how I adjusted the thermostat. On asking at reception, however, the heating was adjusted remotely and from then on it was a good temperature. The en suite bathroom was a decent size, decorated with more black marble - I showered in dark shadows once before experimenting with the bathroom light switches and finding a brighter option. The room lacked shelf space for toiletries, but had the benefit of a good bathtub as well as a powerful overhead shower, plenty of towels (both the Italian tea-towel kind and fluffier versions), face-cloths, toiletries, tissues and good mirrors. I may not have cared for all the modern style affectations in the hotel, but I enjoyed the modern service standards. As well as a daytime clean, the bedrooms also had a thorough turn-down service in the evening - I never caught this being done but on one occasion I came back after a mere five-minute excursion to find the bed turned down, towels replaced, the fiddly shutters closed and some basic cleaning done. On arrival I had a welcome letter, and the desk came equipped with old-fashioned notepaper and envelopes, a pencil and notepad, and a menu for room-service. A proper, good hair-drier was provided, along with slippers. As I had booked the cheapest room type, my window had a gloomy outlook over a narrow lane (though if I were tall enough, I could probably have leaned out to catch a glimpse of the Grand Canal). During my stay, I viewed some of the hotel's more expensive rooms. I was impressed to find that there was a very consistent level of décor and furnishing throughout - even the cheaper rooms like mine seemed as well-fitted as some of the 'posher' ones. The main difference was the views. Naturally the hotel's best, and costliest, rooms look out over the Grand Canal. With one of the very finest views in Venice from the windows, I think the price premium would be well worth paying for guests who are looking for a special experience. 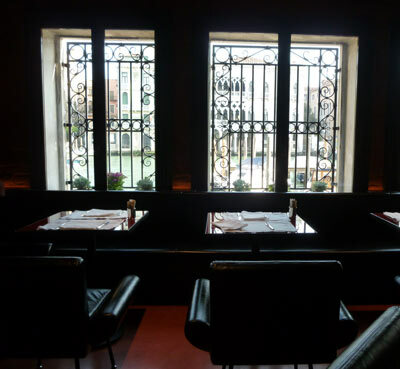 The ground floor of the Hotel L'Orologio has been turned into a large public area with tables and chairs (more red and black, along with clock themes), where guests can enjoy breakfast or an evening drink by windows facing out to one of the Grand Canal's finest sights: the Ca' d'Oro. There's a statement fireplace, more clock-related artworks in glass cases and a small bar. After staying in small atmospheric places in Venice, without much privacy, I'd thought it might be a contrast to experience the impersonal anonymity of a larger hotel. However, this hotel manages a good balance between the two extremes, with friendly greetings when returning or leaving, a comfortable bar/lounge area, but plenty of discretion and reasonably sound-proofed bedrooms. Breakfast is taken in this public area, in the fairly generous timescale of 7-10.30am. "We'll be down at 10.29!" I heard one guest declare. A small room is dedicated to the breakfast buffet: a generous spread including meats, cheeses, bread, small filled croissants, yoghurts, a choice of cereals, scrambled eggs, sausages, fruit juices and even Prosecco. Hot drinks are brought by a waiter; there was a good choice of tea bags but another example of overdesign - if a metal teapot needs a special paper shield to protect your fingers from burning on the handle or lid, not always successfully, isn't it a sign that a non-conducting material might have been a better choice in the design? Other than teapot scalds, breakfast was a pleasant experience. I always selected a table with views out of the window over the Grand Canal, with morning delivery boats passing by and the Ca' d'Oro looking glorious opposite. Hotel bars aren't a big thing in Italy and it is pretty rare to find one like this, with an on-duty barman . There was usually an American or English couple sitting at the bar chatting with the barman and drinking, despite the hotel bar prices (8 euros for a glass of Prosecco, which would cost 2 or 3 around the corner). If this is an important part of your holiday, the hotel is a good choice. The drawback to the bar was a bit of extra noise. My room was on the first floor, by the top of the stairs, and when a couple of guests got animated one night, I could hear the shrieks of hilarity from my room as I tried to sleep. Other bedrooms were further away from the source of noise, so would be unlikely to have this problem. Generally my bedroom was very quiet; just the odd sound from other guests passing the door, the occasional buzzing of the fridge and mysterious beeps, possibly from the nearby lifts. This is a very good location. As well as the views and Grand Canal position, it is also central and easy to find, by Venetian standards. A couple of minutes from the Rialto bridge, it's well-placed for getting around Venice on foot or by boat. There are three ways of arriving from Venice Marco Polo airport. Take a private water taxi (expensive) to a jetty right by the hotel. Catch the public Alilaguna boat service to either the San Stae stop (four bridges to cross on foot) or the Rialto stop (a big bridge, a small bridge and a busy market to cross). Or take a bus to Venice (Piazzale Roma), then catch the vaporetto (waterbus) number 1 to the Rialto Mercato stop (after leaving the stop, turn right, cross the fruit and veg marketplace, pass the arcaded fish market and and then climb one bridge to reach the hotel). (A fourth option, if you've bought a travelcard at the airport, is to take the Alilaguna to San Stae/Rialto and then catch the 1 just one stop to Rialto Mercato to save a bit of walking). I found the Hotel L'Orologio a good, well-run hotel in a very convenient location. Some guests like me may find the modern design touches a bit much at times, but others will appreciate the modern 'look' and find it reassuringly familiar and international. The service is very good, which will please experienced travellers as well as discerning holidaymakers; with thoughtful extras such as the tea tray, the turn-down service and hotel bar. I'm used to accepting the idiosyncrasies of traditional Italian accommodation, but I was still pleased (more than I'd have expected) to find such high standards from the comfortable bed to the generous breakfast. It seemed an ideal destination hotel for couples wanting a smart, comfortable weekend break or a special stay, perhaps for a romantic occasion. Review by Italy Heaven editor. All the photos are my own and reflect the hotel as I found it.